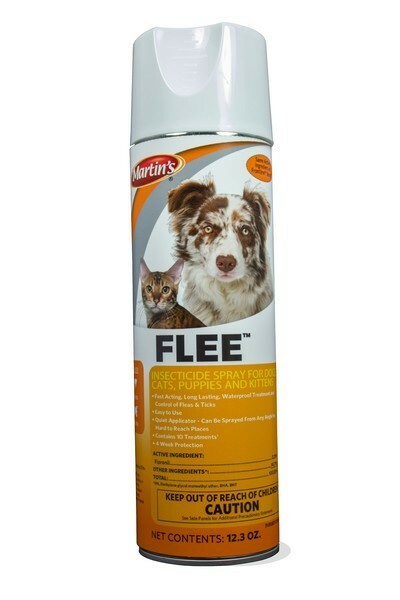 Protect your pets this season with Martin’s FLEE Insecticide Spray from Lochte Feed and General Store. This flea protectant is a Fipronil spray that offers long-lasting, waterproof control of fleas and ticks on cats and dogs 8 weeks and older. Martin’s FLEE can be sprayed from all angles even upside down for easy application. Stop by our location in Fredericksburg, TX to take of all your pest needs. We have natural diatomaceous earth for use indoor and outdoor as well as insecticide sprays for around your premises. We also offer sprays, shampoos, collars and topical treatments to ward off fleas and ticks for your pets. This entry was posted on Wednesday, June 15th, 2016 at 4:23 pm	and is filed under News & Updates. You can follow any responses to this entry through the RSS 2.0 feed. Both comments and pings are currently closed.